'The Earth Remembers' monument, designed and created by Marian Fountain, was unveiled on the 9th April 2017, at the Carrière Wellington, Arras during the Centenary. This ceremony commemorated the men from many nations implicated in the Battle of Arras in 1917. Commissioned by the NZ Lottery Grants Board and the City of Arras, it is dedicated to the memory of the New Zealand Tunnelling Company for their work in the underground quarries of Arras during the First World War.The chalk in these quarries is forever marked with the sweat and courage of those men who carried out very important underground work there. This bronze sculpture, 3m50 high, represents a section of the Arras quarries carved out by the silhouette of a New Zealand tunneller. The visitor is invited to go into the space of this man, a symbolic tunnel, pausing to reflect on the tunnellers with the help of excerpts from their letters and depictions of the men. We put ourselves in the position of the women and famillies who received these letters and who cherished their precious photos. Our gaze rises to the top of the monument, where an exit is oriented towards the rising sun to evoke the departure of the 24,000 British (now the Commonwealth) soldiers at dawn on 9 April 1917. This sculpture also evokes one of the thousands of tombs found in grassed cemeteries in the area, as 300 000 men in total were lost in the conflict. It is a recognition that the people of Arras have lived and grown up on the land which bears the memory of our collective history, and that the graves have been carefully looked after all these years. . The 'gap' of the soldier makes us think of the loss these men's famillies and communities endured at home in NZ. When we come here to remember, we are touched to the core. We look at these men who look at us – we are now the actors on the stage, the descendents in the gap: the living key for maintaining peace. Cette sculpture, dévoilée à la Carrière Wellington le 9 avril au centenaire de la Bataille d'Arras en 1917, et commandé par la NZ Lottery Grants Board et la Ville d'Arras, est à la mémoire de l'implication de la compagnie des tunneliers néo-zélandais dans les carrières souterraines d'Arras pendant la Première Guerre mondiale. La craie des carrières est impregnée à jamais de la sueur et du courage de ces hommes qui on réalisé les travaux souterrains très importants. L'œuvre en bronze, de 3m18 en hauteur, représente une coupe des carrières arrageoises creusé par la silhouette d'un tunnelier néo-zélandais. 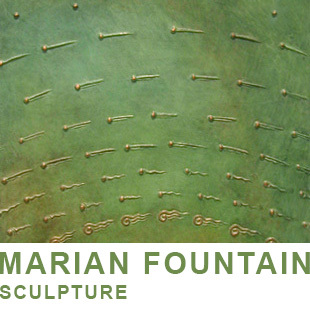 The work of Marian Fountain moves from the antique to the future. From the simple glow of bronze and her ideas, she makes it possible to unite the early merging of our memories and hopes, the incommensurable coupling of the mortal and the divine, of reality and dream. “With bronze I take a thread and cast it into the future” she says. In more ways than one, the forms she creates are concrete utopias with the fascinating ability to whisper the past and the future. Their troubling aura acts as spirits marking a time from which they seem however liberated. L’œuvre de Marian Fountain se promène de l’antique au futur. Par le simple étincellement du bronze et de l’idée, elle rend possible la fusion initiale de notre mémoire et de notre espoir, l’incommensurable accouplement du mortel et du divin, du réel et du songe. ‘Avec le bronze, je tiens un fil et je le lance dans l’avenir’. A plus d’un titre, les formes qu’elle crée sont des utopies concrètes qui ont le pouvoir fascinant de chuchoter le passée, le futur. Leur vibration troublante agit comme l’esprit marqueur d’un temps où elles semblent affranchies.